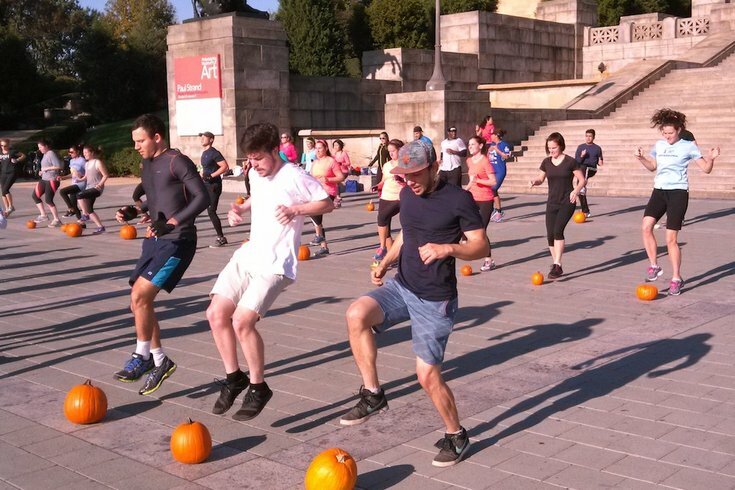 Gear up for Halloween with Core Fitness's annual BYO-pumpkin workout at the Art Museum. If you’re looking to get a little spooky (or festive!) without interrupting your fitness routine all that much, we’ve rounded up a list of 13 Halloween-inspired workouts going on in and around Philadelphia on Oct. 31st, as well as the days leading up to the candy corn holiday. Read on for some Halloween-themed and mischief-filled sweat sessions going on between now and then. What: This Bikram express class will feature the standard 26 Hatha postures performed twice, but instead of the room being silent — only being interrupted by the voice of the instructor — class will be backed by some spooky Halloween-themed beats. What: Join Core-Fitness for their annual Halloween celebration featuring a very festive prop — a pumpkin. You’ll bring a five- to 15-pound pumpkin to make their already difficult boot-camp style workout *that* much harder. What: Learn about the history of Halloween, why it’s called “Witches' New Year” and delve into the world of practical magic. The workshop also includes a sharing circle, some gentle yoga poses, meditation and a DIY herbal craft to take home with you. Be sure to bring a notebook and something write with. What: Join local trainer Katie Gould for a festive twist on her signature Yoga Brunch event. Costumes are welcome, but not required, at this 60-minute Halloween-themed yoga class featuring a festive playlist and some spooky poses. Corpse pose, anyone? Afterward, everyone is welcome to enjoy bottomless mimosas and pastries. Just be sure to enter through the Ninth Street-side door, and don’t forget your yoga mat and water! Cost: $30, but a portion of the proceeds will benefit the Rail Park; Sign up here. What: Palo Santo hosts a heavy metal yoga session every Monday, but this week, it gets a Halloween twist. Expect this flow to be backed by some heavy metal hits that will inflame the practice. Costumes are welcome. What: Glow Sculpt is a glow in the dark version of Lumos's signature Sculpt Jawn class which infuses yoga flows and poses with the use of weights for an extra challenge. Tuck O' Treat is a festive take on Lumos's barre class which will, quite literally, leave you shaking — in a good way. What: Two local trainers are teaming up for a free mischief-filled workout on Halloween Eve. The energetic workout will be filled with stair climbing, strength training and even some partner activities that will get your heart pumping. To refuel, you'll receive a credit upon scanning the QR code at sign in to redeem on your next Honeygrow app order. What: The Wall is opening up their studio to Witches and Warlocks of all kinds for a spooky spin class that will surely leave you drenched in sweat — from the workout or fear, who is to say? What: Led by two of Soul Cycle's most fun and popular instructors, Nick Turk and Denita, these festive classes will surely not disappoint in spirit or in the tunes department. Cost: $30 each; classes for next week open for registration at noon Monday, Oct. 29. What: Daybreaker’s signature high-energy early morning workout followed by a dance party, gets a Halloween twist. While most people dress up for Daybreaker, no matter the time of year, this particular event is masquerade themed, as in everyone will be rocking masks. Fit Academy’s Osayi Osunde will be leading a bootcamp prior to the dance party, so you’ll surely work up a good sweat. Enjoy free kombucha and breakfast bites afterward! What: Get in on Philly Dance Fitness's free all-levels hip-hop class during which you'll learn a "thrilling monster-themed routine." After you learn the choreography, you'll have the opportunity to stay after class to perform a flash mob for trick-or-treaters passing by. What: Join Yoga Hive for an ultra-festive flow during which participants will move from pose to pose in the dark, with only the glow of candles and orange glow sticks to illuminate the studio. Halloween tunes will play in the background, and all participants are encouraged to rock a costume — a prize will be given to the best-dressed. What: Gear up for a challenging Baptiste flow that will be lightened up with some fun and festive tunes as well as costumes, which are welcome, but not required.